A multinational mission to study Halley’s Comet discovers a massive alien spacecraft. On board this craft are hundreds of dead aliens that look like bats, as well as three attractive humanoids. Colonel Tom Carlsen (Steve Railsback) is only person to come back from the mission alive, along with the three beings taken from the ship. He doesn’t remember what happened. One of the aliens awakens, the female (Mathilda May), and drains the life of a scientist before escaping into the English countryside. Colonel Carlsen and team of scientists attempt to discover what she is, and how to stop her before a wave of energy vampirism destroys the Earth. The first thing to notice about Lifeforce is how damn triumphant the score sounds. It’s a bombastic piece that would befit a grand adventure, and feels woefully out of place in what is essentially a mildly sleazy horror film. This is the weird dichotomy of the film; it really tries to sell itself as an heir to the Quatermass films, and be a big science-fiction adventure filled with spectacle and an edge of horror. Instead, it’s pretty much a full-on horror film, with a veneer of SF and a score that belongs in a big-budget action film. The narrative flow of the film is extremely choppy and disjointed. The constant jumping between Colonel Carlsen, the lady space vampire, and flash-backs to what happened during the shuttle mission feel like they were edited together with a sledgehammer. The most glaring problem comes in the third act, when we go to London fully in the grip of a space vampire plague with no build up whatsoever. On first viewing it isn’t clear on exactly how the plague works, or how the vampires feed, or what the heck the giant spaceship has to do with the whole process. Ideally the situation would grow exponentially more dire as we watch the infected people multiply, but it’s a missed opportunity to bring us to the reveal of London in chaos. The effects hold up well. The giant alien ship still looks very threatening; the desiccated but still living victims of vampirism look a bit robotic in their movements but still manage to disturb. The London sequence is very impressive as well, watching a thousand of trails of light swirl up into the sky, each one formerly a living person, manages to evoke awe inspiring sense of dread. Regardless of how clumsy the film was in getting to that moment, the moment itself is superbly realized. The acting is a mixed bag, Steve Railsback’s portrayal of Colonel Carlsen is a mix of sweating and shouting with just a touch of misogyny, so it’s difficult to get behind him as a protagonist. Mathilda May isn’t given much to do except walk around naked, fortunately she’s very good it. Patrick Stewart is Dr. Armstrong, the head of an insane asylum and he receives his first onscreen kiss from Mr. Railsback in a scene that handles a man on man kiss about as awkwardly as you could expect for a film made in 1985. 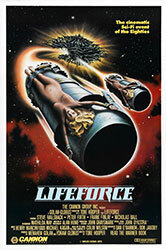 I can’t in good conscience say Lifeforce is a good film, but it is an extremely entertaining one. It occasionally rises above its deep flaws to reveal some astonishingly great moments, and that alone is worth giving it some attention.